Plays nice with Asus Aura lighting control software. We've come a long way since the days of beige boxes with dangerously sharp corners for our PC parts. 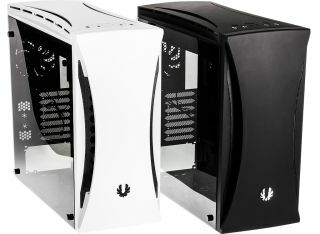 Case in point, BitFenix today announced its latest chassis, the Aurora, with a curved front panel in "midnight black" or "arctic white," tempered glass side panels, and RGB lighting that's Asus Aura certified. Simplicity and elegance were BitFenix's stated goals. What the company came up with is a case that gives viewers a full on view of its guts with a see-through tempered glass panel on one side, and a tinted tempered glass panel on the other to hide those unsightly cables that inevitably get shoved behind the motherboard tray. The case measures 215 x 490 x 520mm and can accommodate the full range of motherboards from mini-ITX on up to E-ATX. That includes 20-25mm of cable management space, which should be enough room to hide a whole lot of cabling. There's also tie brackets and cutouts to help tidy things up. There are two modular drive cages supporting up to four hard drives in the Aurora, plus three modular SSD brackets. If you need the additional space, you can remove one or both HDD cages to make room for liquid cooling (the Aurora supports up to two 280mm radiators up top and front, and a 120mm radiator at the rear) or extra long graphics cards up to 400mm. Circling back to the aforementioned Asus Aura certification, you can customize the illumination of your SSDs and motherboard when connected to an Asus motherboard. Otherwise, you can cycle through included preset lighting by tapping a hardware button. BitFenix didn't say how much the Aurora will cost or when it will be available. We've reached out for those details and update when we hear back. Update: BitFenix says the Aurora will be available on Amazon at the end of August for $99.